My impression of Chiam See Tong’s SPP was that of a party lacking in visions and ideas, as seen from the TV performance of Lina Chiam on Channel NewsAsia’s Political Forum. I also predicted the SDA’s electoral demise as soon as Chiam’s SPP pulled out; it is clear that Chiam was the only one holding the Alliance together, giving it a sense of unity. 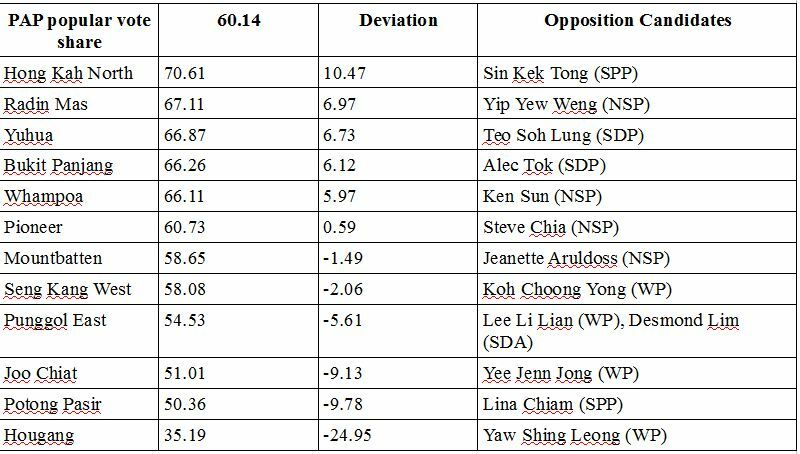 For a short while I’d believed the SPP was destined for certain obliteration, as Chiam struggled to form a dream team for Bishan-Toa Payoh GRC. But what a turn of events! The opposition elder has attracted two former government scholars to contest with him, besides two long-time politicians. And he even asserted his ‘chances are very good’. Though the SPP is contesting 7 seats (5-member Bishan-Toa Payoh, Hong Kah North and Potong Pasir), attention is focussed on the GRC and whether the SPP would make a historic win, with a veteran at the helm of an impressive team of candidates. If The Straits Times is accurate ($2m foundation pledge! and ‘surge in volunteers‘), the SPP seems to be reviving itself at the last moment. What’s the impact of this on S’porean voters and the General Elections? Previously I mentioned which would be a battleground GRC or SMC, and Bishan-Toa Payoh was among the first-tier battleground GRCs. Well, it seems apt for its ranking to increase, from just first-tier to Red Alert. Why? 1) The Chiam appeal. His maiden attempt to lead a GRC has not been smooth-sailing, but the final line-up is solid. Furthermore, it seems more volunteers and sympathizers are helping Chiam to win. 2) Bishan Toa-Payoh, since its meshed-up formation in 1997, has never seen a contest. If we go back a little further, Toa Payoh has not seen a contest since 1988. No one knows how the voters there would vote, because there is no history at all. No straw poll has been taken too, so Polling Day for this GRC would be especially exciting. 3) The PAP team in Bishan Toa-Payoh has NOT faced a contest before – with the exception of DPM Wong Kan Seng, but not in recent elections. Are they electable in their own rights? Maybe, maybe not. As you can see, the outcome is clouded in uncertainty. The voters, the PAP team as well as the opposition, though Chiam’s star power is drawing tremendous attention and effort here. I’d defined a ‘battleground’ with 3 criteria: 1) unprecedented, 2) good chance of opposition winning, 3) controversial or headlines-grabbing. The contest in Bishan Toa-Payoh fulfills 1) and 3) very strongly. I don’t know how S’poreans there would vote, and I bet the PAP or the SPP doesn’t too. It’s a gigantic known unknown, which means the GRC deserves a ‘Red Alert‘ status – a tough fight for both the PAP and SPP.